I’ve been an avid reader of RSS feeds for many years and use a number of RSS feeds to stay on top of things in the UX world. If you’re not familiar with RSS, or Really Simple Syndication, it represents a data feed. With a single URL, you can subscribe to a news or other information source so whenever new stories are published, those stories will be immediately listed in your chosen RSS reader. I personally used Google Reader for many years and was disappointed when it shut down earlier this year. However, like millions of other former Google Reader users, I migrated to a service called Feedly, which ties into Google, and imported all of my feeds. While Feedly has a mobile app, in addition to a website, I am also a user of the iPhone app Reeder, which reformats my Feedly feed (pictured below). If you are already using RSS feeds or are willing to use RSS feeds, consider creating your own custom UX news feed. I used to use Google alerts until Google alerts also stopped being published as RSS earlier this year. Now I use Talkwalker. With Talkwalker, I save my search query and then get a link that I can paste into my RSS reader. Definitely set up an alert for your own name so you know whenever you appear on the web. In my case, I’m the only Cory Lebson out there, but if you have a more common name, this may mean you have a bit more to sort through. Create alerts for whatever UX topics you’re interested in. Terms could be as simple as “User Experience” or could represent various aspects of UX; for example, if you’re really interested in the latest posts on responsive design, you could set up an alert for this topic. You’ll have a choice of all results or just the best. I’d suggest that you just look at the best. Even then, you may have to play around a bit with your alert terms to get the results that you want. 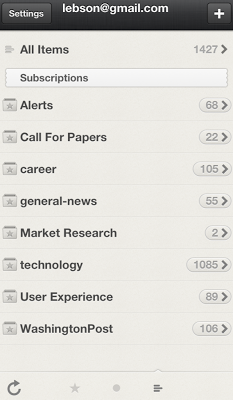 I also like to stay on top of calls for papers or speakers that are at least somewhat related to UX. WikiCFP has a number of RSS feeds around particular topics, including some that overlap UX. In addition, you can set up your own call for papers alert based on whatever topics you might want to speak or write about. During times that you are looking for a job, you may go to career sites like CareerBuilder, Monster or other similar sites. Many of these career sites allow you to create your search as an RSS feed. That way, whenever new jobs are posted that match your criteria, those jobs will appear in your RSS feed. Even if you are not looking for a job now, as you discover good searches that show you interesting jobs, save these searches as RSS feeds. Personally, while I haven’t looked for a job as an employee in many years, I set up feeds on these career sites to look for short-term contract work. Most of the time my work comes through word of mouth, but in case things slow down, I appreciate knowing that I have this feed of possible options available to me. And I have really managed to find project work for Lebsontech this way. While my technology section is not specific to UX per se, I believe that it is important for UX professionals to stay on top of trends in technology as a whole. I like reading such blogs as Engadget, Gizmodo, PC Magazine and Slashdot among others. There are tons of tech-oriented publications out there. The user experience section is the gem of my RSS feed.This is the first section I read and is the one that most directly keeps me informed on what’s going on in the larger UX world. Some of my favorite feeds are UX Magazine, UXmatters and Smashing’s UX Design. I also have a bunch of corporate blogs that are in some ways parallel to my DC Usability blog. If you enjoy some of the UX periodicals and blogs, definitely pull some of these into your feed and read them regularly. One more thing to note is that when I find something particularly interesting, I try to call it out on Twitter, which not only allows me to share what I find most thought provoking, but also effectively gives me an archive of my favorite UX posts. While usually unrelated to UX or technology, you can also keep general news in your RSS feed. Living in DC, I read the various sections of the Washington Post regularly, so I devote a separate folder to this newspaper. In addition, I have a general news category, which includes the Personal Journal section from the Wall Street Journal, and the RSS feed from Consumer Reports, among others. Never stop learning about UX. Don’t let your UX knowledge stagnate or be limited to your work environment. Even if you are pressed for time, just commit to a few minutes a day to read or skim whatever feeds you consider most critical to your UX career knowledge. Maybe you won’t get it all, but at least you’ll stay somewhat up to date on what is new and exciting in the UX world.